Recent release “Charley and Cari's First Day in Puppy Kindergarten” from Page Publishing author Emily Acevedo is a vibrantly depicted children’s book full of animated animal characters. 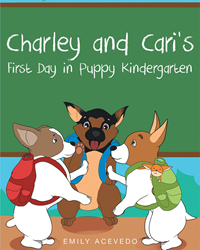 Emily Acevedo, a devoted teacher, writer and author, has completed her new book “Charley and Cari's First Day in Puppy Kindergarten”: a fun and entertaining story about preparing for school and accepting change told through the main character, a puppy. Published by New York City-based Page Publishing, Emily Acevedo’s captivating story is full of animal characters that will be loved by children and adults alike! Cari and Charley are very excited about starting Puppy kindergarten! They are even more excited about having Ms. Riviera as their teacher, but as the days grow closer to the first day of school, Cari asks, “What if Ms. Riviera doesn't come back?” Charley tells his sister that won't happen, but secretly he wonders, what will he do if she doesn’t come back? Will Puppy Kindergarten be as much fun with a different teacher? Join Cari and Charley as they prepare for the excitement and unknown of their first day of Puppy kindergarten! Readers who wish to experience this enjoyable work can purchase “Charley and Cari's First Day in Puppy Kindergarten” at bookstores everywhere, or online at the Apple iTunes store, Amazon, Google Play or Barnes and Noble.